Creating spaces that allow you to maximize your time is a must-have in new home construction. This is why upper level laundry rooms have become so popular. Having the laundry room located on the same floor as your bedrooms makes the task of doing laundry easier! Here are a few features to consider when designing your laundry space. 1) CABINETRY – An easy way to make your laundry space look clean and organized is to include cabinetry into your design. Cabinets allow you to hide detergent, cleaning supplies, and any other items you want hidden from sight. Drawers also allow you to include pull-out hampers and a hidden ironing board for better use of space! Hidden hampers hold clothes and keep all of your dirty laundry out of sight until you have the time to do the laundry. 2) HANGING RACKS – No more draping clothes over doors or laying them across a surface to air dry! By installing a hanging rack, you can hang your clothes straight from the washer with no hassle! Choose a steel bar, retractable clothesline, or fold-up rack to meet your needs. 3) COUNTERTOP HEIGHTS – Varying countertop heights have different purposes. A raised surface is perfect for folding your laundry as you pull it out of the dryer, while a 36” countertop height is more comfortable for hand washing clothes in your utility sink. 4) SHARED SPACE – If you are running out of space to fit everything in your home, think about combining your laundry room with another space! Whether it is the mudroom, home office or craft room, combining these spaces is an easy alternative. 5) CUSTOM DETAILS – To help add some spice to your laundry room, add in a fun light fixture or painted cabinets. With warm colored cabinets, a pop of color on the walls or an eye catching light fixture, the whole ambiance of your laundry room will change! 6) MESSAGE BOARD – With a message board in your laundry room, you won’t have to worry about any more shrunken sweaters after your significant other accidently puts the wrong items in the dryer! Hang a chalkboard or dry erase board by your machines to leave notes for your family members who might be switching the loads while you are out of the house. These are just a few fun ideas for your new laundry room. If you have other fun features, feel free to comment or email us – we love hearing your ideas! 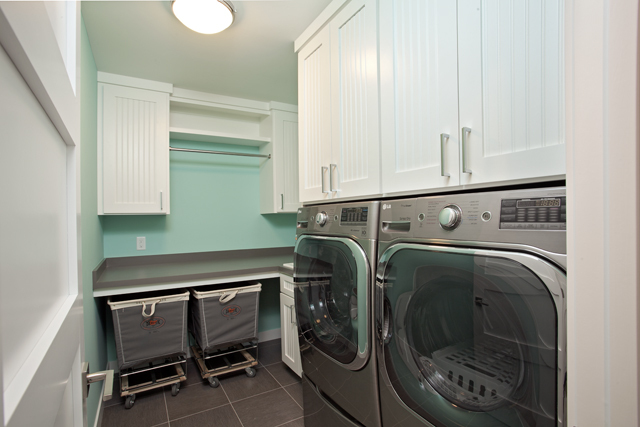 For more photos of our laundry rooms, check out our photo gallery.